The hackers that tend to get in the news are most often portrayed as unkempt young men who unleash their social insecurities and pet peeves through computer code, sabotaging governments, corporations, and other structures of the western civilization that can be accessed via the internet from their parents basements or dimly-lit dorm rooms. Some of them end up in jail, some get jobs working for The Man and some become The Man Named Zuckerberg. But hacking can take other forms as well, drawing upon the tradition of do-it-yourselfers, the Ben Franklins, the maverick inventors and tinkerers who have often fostered key developments in the technological transformation of our world over the past few hundred years. The Internet and perhaps the economic downturn has brought about a new wave of hackers who have been organizing their energies the world over in places called “hackerspaces”. brmlab, the first Czech hackerspace, has been operating in Prague for about a year, and it very well might be the home for anyone with a love for all manner of experimentation. As Pavel Růžička (or Růža), one of the members of brmlab, explains: “The word ‘*Hacker*space’ uses the term ‘hacker’ in the more traditional sense of ‘an expert or enthusiast of any kind.’ We are curious people that enjoy finding out how things work and overcoming the current limitations.” They do have a couple of people interested in computer security, but that’s not really their main focus and they avoid any “unethical activities.” brmlab welcomes anyone with an interest in technology and cooperation. The 30 or so regular members (and dozens more collaborators) are motivated by different reasons, with willingness to learn almost counting for more than actual knowledge. About a third of brmlab’s members are students, while the rest mostly have an IT or professional electronics background. Scientists, artists, and others are also welcome. In a testament to the hackerspace’s significance, some of its projects are being worked on in cooperation with Charles University and the Czech Academy of Sciences. The central attraction for people to join the hackerspace may be as Pavel says “to connect to people to create great things”. For their “Brmbot Outdoor” project, hackerspace members designed an autonomous outdoor robot. It is specifically optimized for the RoboTour contest, which calls for self-navigating robots wandering along paved park roads till they reach their target GPS coordinates. The robots get extra points if they carry things (like five liter barrels). 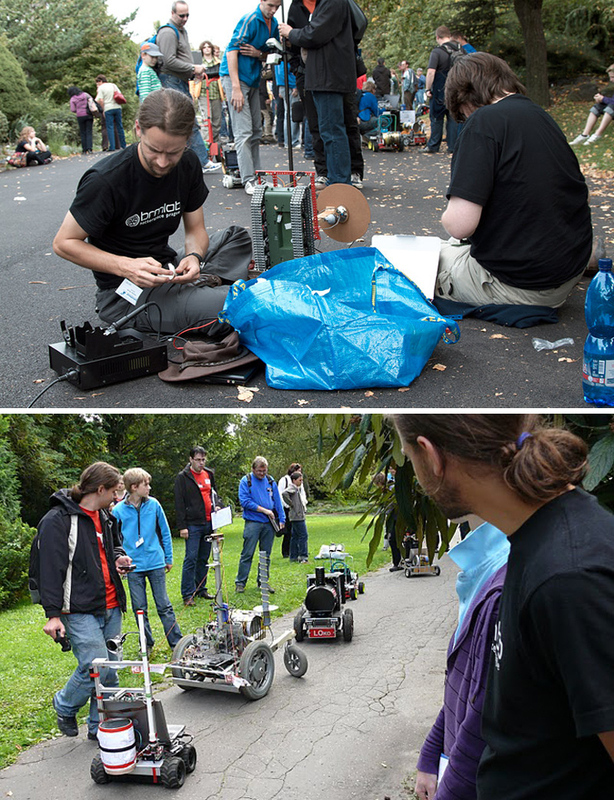 For the first few years the contest was taking place in Stromovka Park in Prague, but has since moved on to other cities in Czech Republic and Slovakia, and this year is taking place in Vienna. Beyond robots, there’s a plethora of other projects being worked on at brmlab, from 3D printers to rats controlling Roomba vacuum cleaners to anklets which tell the wearer which way is North. The variety of projects is impressive. Anyone (even a non-member) can create a project and start hacking. As Pavel notes – “if it’s cool, others will join in or at least offer advice.” The people who make the projects, own everything they create but most of the work and blueprints are freely published on the web, for anyone to see and tinker with. This democratic approach is further practiced in the “Lightning Talks,” which take place at 20:00 on the first Thursday of every month. Various speakers present around 10 talks (each is 5-10 minutes long), designed to introduce the audience to some topic. Afterwards people are free to mingle and discuss the ideas they found most interesting. The best speaker of the night gets a cool brmlab t-shirt. The next session is on October 7th, and you can sign up to present a topic right here: http://brmlab.cz/event/lightning_talks. In fact, brmlab has several devices available (like EEG and EKG) that can allow you to explore the mind, but as they advertise on their site, they could use some “brains (preferably inside skull)”. The devices allow members to pursue such passions as exploring unintentional blindness, turning on savant abilities or simply lucid dreaming. For a less high-minded but cuter project, you can turn to The Fluffy Ball, which is made from a disemboweled fluffy rat from a toy store and a 15 CZK microphone and is a digital input device that can distinguish between types of physical contact (specifically punching or fondling). Other projects of note being hacked up at brmlab take place at their Biolab, which is a small room that’s split off from the hackerspace’s kitchen and features an assortment of lab equipment (like a DIY laser microscope). The Biolab’s aim is to provide a place to bring experimental biology to the masses, with a setup that allows for usually hard-to-access lab procedures like DNA extraction and sequencing or conducting behavioral studies. Future endeavors envisioned by brmlab hackers include building an exoskeleton, experiments in virtual reality, or launching Brmball, a “semi-autonomous stratospheric balloon that can do some basic scientific measurements, take pictures and communicate with ground station.” Obviously, the sky is not the limit. If you’d like to join this hackerspace, you should note that it’s maintained purely by member dues, which are 500 CZK for regular members or 250 CZK for students. You’ll be able to use the space’s resources, get invitations and discounts to cool events as well as have the right to vote on community decisions. More info on how to join is here. You can also help the hackerspace by donating some equipment. As all true MacGyvers, they have a constant need for lots of duct tape and wires. Or maybe you have a centrifuge or the latest supercomputer collecting dust in your trunk? Here is their equipment wishlist. You can find the brmlab at Bubenská 1. As their directions state, it’s a “large building near the subway station Vltavská (line C), just on the other side of the highway. You should use the entrance from the highway side! (Big ORCO logos everywhere.) At the gate, say you are going to Brmlab, and follow the arrows.” Sounds easy enough, unlike the legendary German hackerspace c-base, whose mythology is that it’s located in an abandoned space station that somehow found its way under Berlin. The brmlab can be reached at +420 608 801 582. The hackers are usually there in the evenings. If you are interested in hackerspaces in general, you can check out other influential hacker groups of this kind. Berlin’s c-base and Vienna’s MetaLab are credited with being the inspirations for many such organizations around the world. Other notorious groups include NoiseBridge in San Francisco and NYC Resistor. There are by some counts 124 hackerspaces in the US alone. They are highly influential in the development of a variety of startups, from solar hot tubs to autopilots for robots to food delivery companies.